Vaidy, The lot numbers can be automatically assigned by receipt date (or) expiration date (as defined in the Inventory Control Setup). 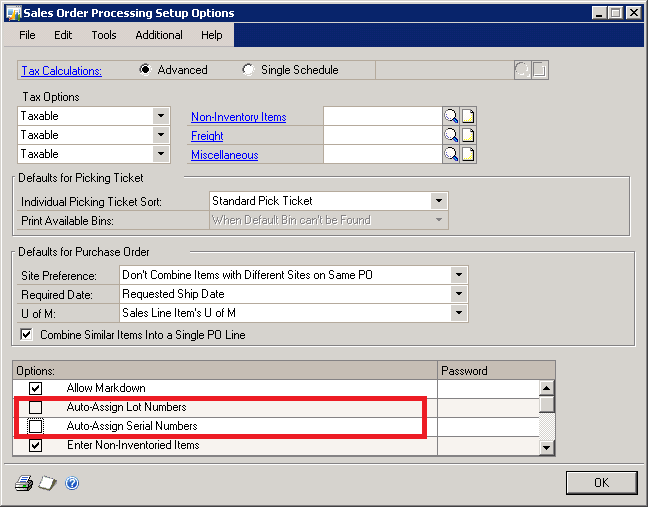 If we choose to assign by Receipt Date, the automatic assignment will happen in the order of the receipt date for the lot. If we choose to assign by the expiration date, the automatic assignment will happen in the order of the expiration date (i.e.) the lot number with the nearest expiration date will be used first.In case of automatic assignment of serial numbers, it will be based on the valuation method defined for the item (FIFO or LIFO etc). Hope this helps. Vaidy, As I had discussed with you on the phone, if an item with valuation method defined as Average Perpetual, is tracked with Serial Numbers, the serial numbers are assigned automatically in the order of the Receipt Date (FIFO) by default. You can check this from the Serials Inquiry window from Inquiry >> Inventory >> Serials.Let me know if you have any questions. Well, that's quite clear. Unless we select Serial Numbers manually, it indeed takes S/N based on receipt date FIFO. Thank you very much for your inputs.